I'm doing a simple solar setup, i need help on which cables to buy. Hello, so since we got hit by hurricane Maria in PR I've been doing a little small solar project to power up a fan, tv and xbox 24/7. So far I've bought 2 100w 12v solar panels (i will buy 2 extra panels soon), a 30amp charge controller and 2 100ah deep cycle batteries, the tv use about 75 watts, xbox one s runs about 50 watts, and a fan runs about 100 watts on high i think. I am completely new to solar power and i pretty much now very little, i am an absolute noob on this, I've been reading about what cables i should buy and i just got more confused, so i made an account to ask directly to you folks! What cables do i need to connect parallel the solar panels? 4 100w 12v panels. What cables to i need to connect the panels to the charge controller? And should i use a fuse in between the panels and controller? Also what cables to connect the controller to the batteries? And lastly what cables to parallel connect the batteries? I have both amazon and ebay accounts, if you can provide a link to cables that you recommend that would be fantastic! First of all, your power numbers are grossly off. An Xbox One uses 72 watts while streaming NetFlix, and 112 or 113 watts while gaming. A 20 inch box fan only uses 60-80 watts, on high, assuming it isn't extremely old. See this link for Xbox One power usage: https://www.extremetech.com/gaming/182829-new-report-slams-xbox-one-and-ps4-power-consumption-inefficiencies-still-abound BTW, both your television, and your fan, have writing on the back of them that tell how many watts they use. Re: what wires you need. You need the wires with connectors that match up to the panels you've bought. The farther away the panels are from the charge controller, the thicker they must be. Also, it also depends on what type of charge controller you've bought. MPPT controllers allow you to use much smaller wiring, since the amperage is so much lower, at the elevated voltages that they require to operate. One last thing. Two 100 watt panels will provide you with 600 watt hours/day, which is only enough power to run your Xbox One for 5 hours of gaming, or 8 hours of streaming. They will not will not also allow you to use the television or the fan any at all, though. Of course, it would probably be more prudent to use the fan for 6 hours, instead of the television or Xbox, but you can use the power for whatever you like. To run what you are dreaming about running, for 24 hours/day, you'd need around sixteen 100 watt panels, since you have to supply the ~115 watt Xbox + 75 watt for the fan, + whatever amount your television uses, in addition to having a bunch left over to recharge your batteries. The batteries also won't last all that long, discharging them that much every day. Good luck, and consider finding yourself a generator. Even a small one will easily run all of those things you mentioned, for months at a time. First, i have the xbox one s which uses about half power of the regular xbox one that you posted in the link, watching tv it can consume about 30 watts and gaming 50 watts, the tv says it uses 75 watts, and the fan i have is a Lasko fan from walmart which does not indicate the watts usage so i just googled it and found the average fan uses 100w, it's a cheap old looking fan so I'm not entirely sure on it's usage. I have 2 at the moment and i will order 2 more, now I'm confused on what you said about needing 16 100w panels to run a 225 watt system, i exaggerated saying i needed it 24 hours, to be extremely specific i will probably use the xbox and tv for about 5 hours a day mostly watching movies sometimes gaming, and the fan probably i will use it about 16 hours a day, in Puerto Rico we get about 10 hours of good direct sun everyday, which i think if I'm not mistaken my 4 100w panels can produce 4000w on a perfectly sunny day? Do they not produce 100w per hour each give or take? I know there's a lot to consider so i thought even if it produces 3000w a day it should be enough? Or am i calculating it extremely wrong? And what i forgot to add is that i will be installing the panels on a second floor roof, so I'll be using about 40 feet of cables, any recommendation? And my charge controller got lost on the post office, any recommendation of a good charge controller for my setup so i can order it with the cables and panels? Thank you so much for your patience and i don't know anybody who has a solar setup to help and this is my first time trying this on my own! If i can't run the xbox and tv i would be content with running the fan only, as i also have a tight budget atm. Where to start? Loads is the best starting point, let's assume the TV and the X Box use 200W and the fan is 100W, which is pretty high for a fan, but let's use that as a starting point. The hours of daylight are not the hours of productive sun, in Puerto Rico the average is around 5.5 hours. Panels rarely produce the wattage they are rated at, 75% is a good rule of thumb, so the 400W array actually would produce 400 × .75 × 5.5 = 1.650 Kwh, so well below the the load requirements. It gets worse, there are other losses, cable, battery, charge controller and inverter which have to be factored in. Realistically you would need about 10 100W panels to satisfy the load requirements. The battery situation is another story, if the loads are nighttime loads the battery must be large enough to support them, without dischargeing below 50%, but you wouldn't want to do that because the next day may be cloudy, so the capacity must be large enough to compensate, 200Ah is nowhere near enough, about 4 times or 800 Ah would be more realistic, unless of course a generator is part of the picture. That TV, gaming console and fan are becoming an expensive proposition, I would suggest getting a 12Vdc fan use what you have so you can sleep at night , get a pack of cards, be creative and wait until the grid is restored, because off grid is not as simple as it appears on the surface. As Myocardia has mentioned, you can run higher voltages with an MPPT controller. At a distance of 40+ feet from your array to your controller you will be able to keep your wire small using an MPPT controller. You would be able to simply wire 4 panels in series and not need any fusing between panels and controller. If you end up getting 4 more of those panels you can series wire them as well and still not need fusing for those 2 paralleled strings. Myocardia also mentioned needing to charge your batteries while simultaneously running your loads. If you are drawing power throughout the day you need to be able to run your loads AND charge your batteries so that you have available power for when you aren't making power with solar panels. Hence the 16 panel suggestion. You really need to get an accurate accounting of your loads and start from there. You will likely benefit from going with a 24 volt system because 1600 watts into a 12 volt system would require you to use two expensive 60 amp controllers. You may not need 16 panels but until you calculate your loads and required system you will just be guessing. BTW can you buy larger 250 - 300 watt panels where you are? They are much cheaper than 12 volt 100 watt panels. You should be able to sell those 100 watt panels pretty easily given the circumstances there. Best of luck to you. Must be awful having to deal with the conditions there following such a devastating hurricane. It's probably going to be a long time till a normal day to day life resumes. Hope we can do a little bit to help you with that. I'm inclined to agree with LH2 on using an mppt controller. With more than two panels in parallel, by the time you install fuses/breakers and related holders/boxes, and heavier cable to the controller, it will likely more than offset the extra cost for a decent mppt controller. Morningstar, sold by our host, makes some nice small mppt contollers. Midnite kid would also be a good choice. You don't appear to have bought an inverter yet. I suggest you look at a small true sign wave type, like a Morningstar 300w. You can find much cheaper modified (square) wave inverters, but they may or may not run the tv and xbox, and the fan will use more power and generate heat with the extra. Thank you all for your input I'm starting to understand how it works and i still love it! For now due to my job being on pause i will not invest more $, i will do with what i have i forgot to mention that i have a Duracell 400w inverter on my car and a 1000w connected to the battery, I'm just waiting on my controller to arrive so i can hook it up, i figured if with my system i can charge my phone and run my fan at least through the night its good enough for me, just got some good lte were i live so i can finally use internet at my home on my cell. I was thinking of getting a battery charger so when i have my generator on i can also charge my batteries when it's not solar noon, also any way i can check when it is solar noon in PR? 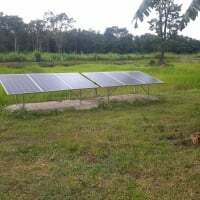 I am looking forward to keep using this forum and when everything is back to normal here i can invest on solar energy at least little by little. Online, you could search for "solar inclination and azimuth calculator" and you should find something.